No doubt, weekly BNI meetings are the heartbeat of the organization. The support you get from fellow members is unparalleled. Friendships developed there can last a lifetime. Tips gleaned from others can hike your profits as nothing else can. 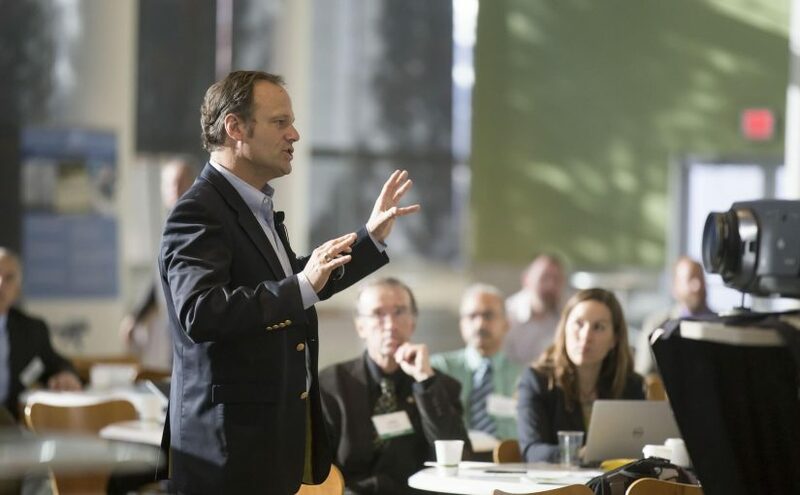 Above all, the meetings get those precious referrals and leads flowing into your business. What if I told you there’s more? You can supercharge your referrals by adding steroids to what’s already a sleek lead generating machine. By putting a bit more effort into marketing your business online. Yes, with a bit of help, your business can be found on the first page of Google for local searches and grow even more. Don’t have time to read all of this? Contact our President, Sean Work, on Linkedin and he’ll be happy to explain how this works. Once people meet you in person, naturally they want to find out more about you. They want to check out your online bios, take a look at your testimonials, or get your contact details. To do that they google you. When they do, you want to make sure what comes up in Search Engine Results Pages (SERPs) is only what you want them to see. You want to look good and make a great first impression. Your first-page presence should be optimal and communicate exactly what you want them to know about you and your business. Just the other day I googled a fellow BNI member who lives down the street. I’ve known him for ten years. Guess what popped up? A website he didn’t want indexed showed up first! I’m sure you don’t want that to happen to you. That’s why I’ve come up with this step by step guide to help you so your first-page presence is the best ever and people see you in a favorable light. We’re going to discuss how to do just that in five steps. 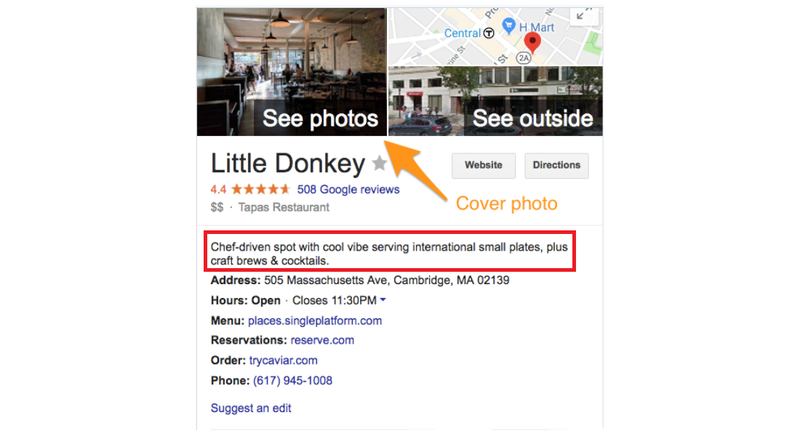 The foundational step of it all is claiming and optimizing your Google My Business (GMB) listing. Because a fine-tuned GMB listing is the kingpin in local SEO we’ll spend a bit of time on it. But it’ll all be worth it when you begin to see results. When you register your business on Google My Business, you earn a sidebar space in Google local searches. This is prime real estate you can’t afford to miss. 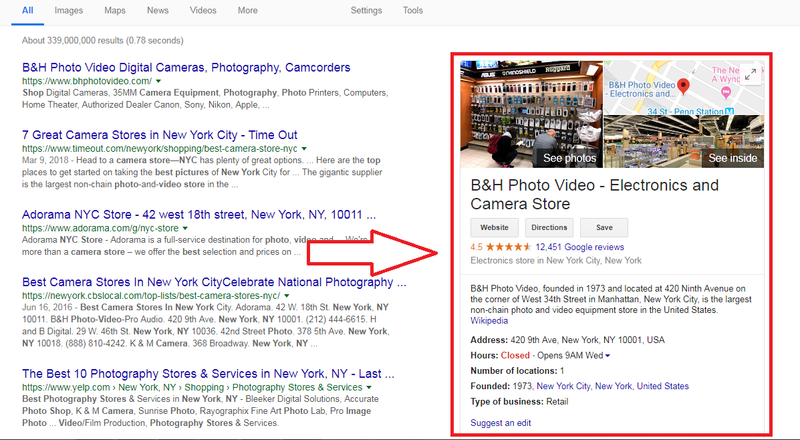 Here’s the search result you’ll get when you look for ‘best photo and video equipment store in new york’. B and H comes up in the prominent box on the right. Nobody can miss their GMB listing. That’s exactly what you want to happen when people Google you or your business. Step 1: Visit https://www.google.com/business/ and click “Start Now”. Step 2: Select (or create) the Google account you want to use and sign in. If you’re already logged in once you click “Start Now” you will be taken straight to step 3. Step 3: Fill in your business name in the provided space. Step 4: Fill in your business location details. If your business doesn’t serve customers at its address, you should list it as a service-area business on Google. To do that click on the ‘Learn More’ at the bottom next to the truck icon. Step 5: Drag and position the red Google map marker to the exact spot where your business is located. Step 6: Add the areas you serve. Distance around your business location. Deliver to customers’ doorstep in the locality. Select your preference and fill in accordingly. Choose a primary category that describes your business as a whole. Here are some quick tips on how to choose a category. When choosing a category try to be hyper-specific. For example, choose “Nail salon” instead of “Salon”. This may sound trivial but it makes a big difference when people search for your services. You can’t create your own category. If the category you had in mind isn’t available, choose a more general category that still accurately describes your business from the drop-down list provided. What’s important is for you to choose a category that best describes what you do. You can always come back later and edit the entry. Chances are Google will be updating Google My Business every year so your specific category may show up in the future. Input your website address and the phone number you want customers to use to contact you. Use the business name you incorporated with (i.e. your full legal business name). Make sure you have a consistent format for your address (e.g. Street name and number, Suite number, City, State and ZIP). Stick with the same address format in all your listings (e.g. don’t use ‘Suite’ in one listing and the abbreviation ‘STE’ in another). Once done you’ll be asked to if you want to receive tips from Google on how to improve your listing. Select yes if interested or no if not. Phew. You’ve reached the last stage. Click on finish. Congratulations! Your business is now listed on Google My Business. One more thing. You’ll then be asked to verify your business. You have three choices at your disposal. By postcard – the postcard is mailed to the business address you entered earlier. It can take up to 14 days for the card to arrive. By phone – this is the fastest method of verification. You’ll receive a call on the number you provided to confirm if your details are correct. By Google Search Console – if you’ve already verified your business’s website with Google Search Console you may be able to instantly verify your listing. This is only possible if you signed into GMB using the same account you used to verify your site on Google Search Console. However, note that some business categories may not be eligible for instant verification. While you have the option to verify it later, I wouldn’t do that if I were you. Why? Simply because you can’t make full use of your listing if you’re unverified. As soon as you choose mail you’ll be automatically taken to your dashboard. As you can see in the shot above, at this stage only 50% of your profile is complete. It’s time to fill in the rest of your info and maximize your listing. Pay particular attention to three important components. Your cover photo and summary play a pivotal role in the success of your listing. Here is how to get them right. According to Google, businesses with photos receive 42% more requests for driving directions to their location from users on Google Map, and 35% more clicks through to their websites than businesses that don’t have photos. Choose a catchy photo that truly represents what you do. To upload your photo click on ‘photos’ on the left side of the dashboard or on ‘add profile photo and then ‘choose photo’ under ‘Cover’ in the middle. This is a brief piece of text of up to 150 words that sums up what your business does in a memorable way. Make sure you include the keywords you want to show up for in search and rank for. To edit your business description click on ‘add description’ on the right side of the dashboard. Make it exciting so people are eager to click. Here’s how your listing appears in search results if your photo and description are optimized. See the cover photo on top and the description under it? Your profile photo is what appears when you upload new photos, videos, or review responses. Add other pictures to make your listing more instructive and compelling. Make sure your GMB listing is complete and up to date. The gap in conversions between a complete listing and an incomplete one is massive. Surely you don’t want to miss out on all these sweet benefits. The title tag is a specific tag that exists in your website code. It’s incredibly easy to understand what it is and how it helps your presence in Google. First, let’s peel back your website’s outer skin and see what’s behind the surface. 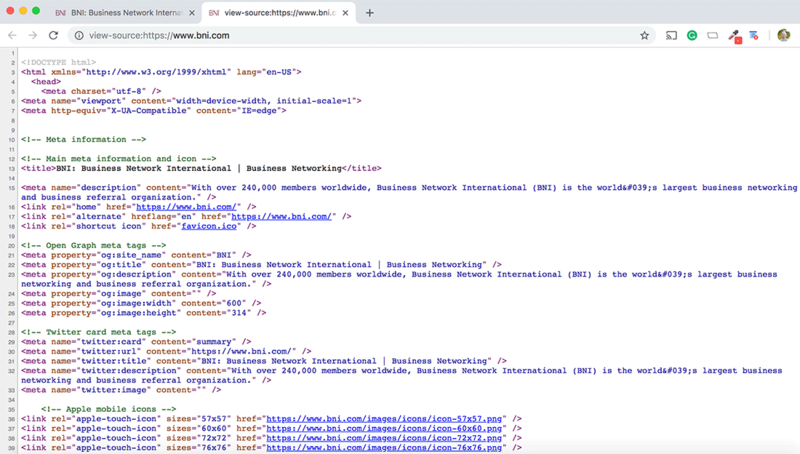 Actually, let’s use the BNI website to demonstrate how to see source code. Right click and “view source” (this works for most web browsers). And viola! There’s the source code. It looks intimidating, but it’s not 🙂 . So, what exactly is this title tag? Title tags are a bit of HTML code used to specify the title of a webpage. Its main job is to tell visitors and search engines (as briefly as possible) what a web page is about. 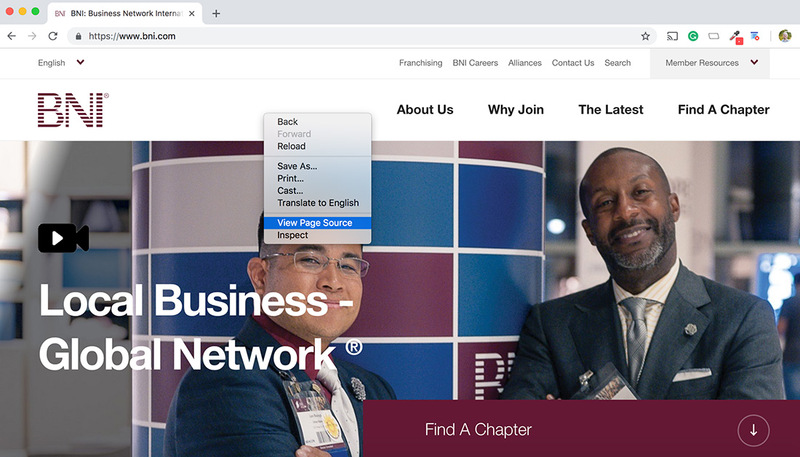 We can see here that the title tag on the BNI homepage is telling humans and robots that read it, that they have found a webpage about BNI and that they do “business networking”. When you hear people talk about “keywords”, well this is where those important keywords that describe your business should live. There’s an art to how you should add keywords to your site, but 90% of it is just making sure your most important keyword is in the title tag of your homepage. Don’t go overboard adding the same keyword or keywords to every page on your site. That’s how you start messing stuff up ;). Just start here. Now, a page’s title tag and meta description are usually shown whenever that particular page appears in search engine results in response to a query. 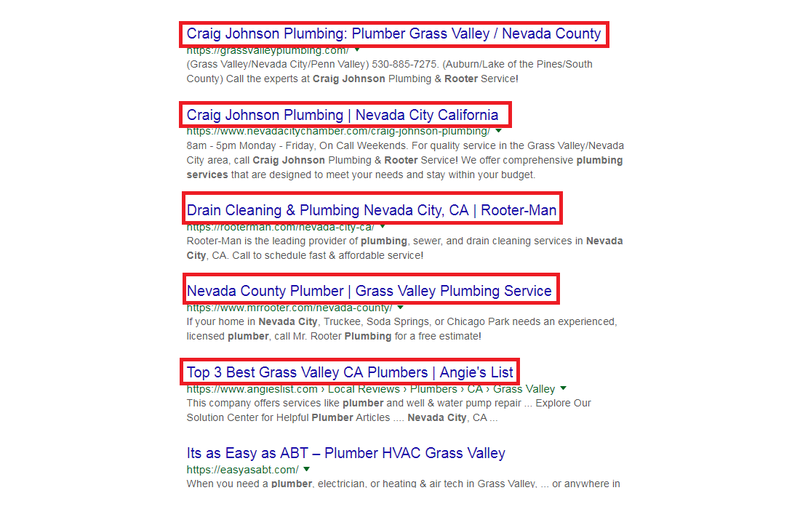 Here’s an example of title tags for the search ‘plumber Nevada city’. Below the title tags are the meta descriptions. They add a bit more info to what’s mentioned in the tag so readers have a clearer idea what the page is about. If people (and search engines) think your page is relevant, you’ve scored some SEO points. social media sites like Facebook or Twitter. You better make them good because they follow you all over the internet. Where/how do you edit your title tag? This stuff can get tricky. Contact our President, Sean Work, on Linkedin and he’ll be happy to explain how this works. You can add a title tag in the <head> section in your site’s HTML as shown in the code we talked about earlier. If you’re uncomfortable touching code – there’s sometimes an easier way to edit it. If you’re using hosting service like Wix, Shopify or Squarespace, you can usually edit your homepage title tag in your settings. You can always check to see if your changes took effect by checking your source code (as shown above). How to optimize title tags? Throw in your long‐tail variation in there too if possible. But don’t go overboard! Focus on being clear not clever. Communicate the biggest and juiciest benefit of doing business with you. Make sure there’s no disharmony between your tag and the content of the page otherwise you’ll confuse search engines, annoy people, and increase your bounce rate. Your whole title will stand a chance of showing up on Google if you keep it under 60 characters. Overshoot the limit and some words will be cut off before you communicate your message fully. To preview your tag and double check its length, use this handy Title Tag Preview Tool. Well done tags will spur people to click through to your site. You don’t want to duplicate title tag copy across your site. Each URL (each webpage), should have its own unique title tag. Otherwise, search engines will get confused when it comes across two pages with the same title tags. Strategically incorporating geo-specific content on your site can give you some SEO juice. Geo-specific means that the content displayed to the visitor is tailor-made for their specific location. The content can be in any form (infographic, video, map, image, text, etc.) and is related to a specific locality, which can be a city, state, region or town. Location specific content is crucial in local SEO. According to Buyer Legends, when visitor experiences were personalized based on their location, it can raise conversion rates by as much as 100%. Here are 2 simple ways to massage location-specific content on your site. Sounds basic I know, but it’s crucial. Include your business local street address and telephone number on all pages of your site. Use text not a graphic so search engines can crawl it and find your business. This boosts your business’ visibility on location-based searches because Google uses geo qualifiers like city, state, zip code, etc. to generate results. And, always keep your business’ address up to date otherwise it won’t show up in ‘near me’ searches. Gives search engine spiders a location signal of your business. Gives clear directions of where you’re located so locals find you easily. Here’s an example from a British company, Muffin Marketing. Note that they name the areas they serve. This lets Google know where they’re located. Incorporating where you’re located and the areas you serve will ensure that Google returns your business as a search result whenever locals search for services related to what you do. Content is the currency of the internet. And while we highly recommend writing amazing blog posts (because they generate amazing SEO value), videos are probably more effective for most local businesses. And besides, you can always have someone turn your videos into blog posts later 🙂 . In your videos, teach, don’t sell. Sharing useful educational videos allows you to demonstrate your expertise. Once business colleagues or potential customers see you do your thing regularly, they’ll be more confident and comfortable to refer you. Coming up with a short 5-minute video isn’t difficult. You already have a great recording tool on hand: your smartphone! Not all videos are created equal. Here are 3 hot types of videos that draw immediate attention. Come up with simple videos showing people step by step how to do something related to the problems you solve. For example, if you are a plumber, you can do a brief video on ‘How To Fix A Blocked Sink’. Slip in your brand/business name and contact information into the title and on screen. Here’s an example from Wickes, a British company. You’ll be surprised how popular these basic how-to videos are. 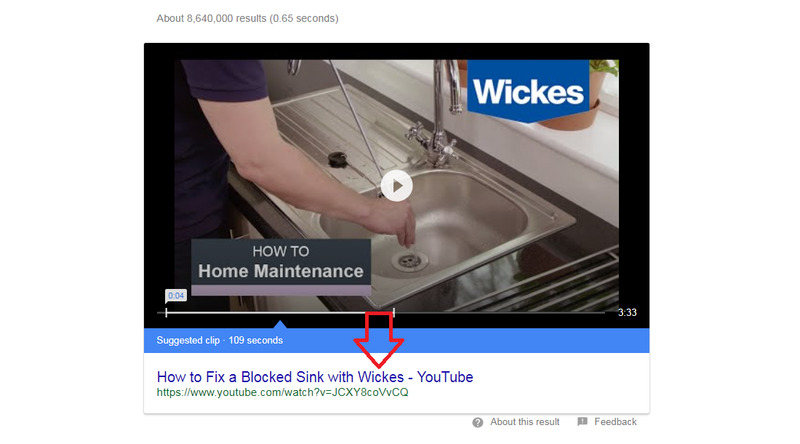 Search for ‘how to fix a blocked sink’ on YouTube and you’ll see these sort of videos have clocked over 1 million views! Certainly, people feel safer after watching this. Or, if they identify with the warning signals, they’ll fix their roofs and be safe. Involving your audience in video creation is a powerful way of building community. Encourage your customers to produce videos about how your product or service positively impacted their lives. Post these videos on your site, GMB listing, and social media accounts. Video company Epipheo use customer testimonials well. Contact info– give people your contact details like phone number and email address. Call to action– say exactly what you want people to do after watching e.g. share video, download a guide etc. Relevant video content generates a lot of goodwill towards you. Plus, it makes people know, like, and trust you. Question: who would you recommend to your contacts? The nice but quiet guy who never misses a BNI meeting? Or, the one whose video helped you get out of a jam you the other day? I know what you’re thinking: who has time for social media when everyone’s crazy-busy? But here’s the thing. A lot of BNI members are on social media. It’s important to connect with them there. This doesn’t mean you spend the whole day on Facebook. It simply means you set aside a bit of time each day to build your social media presence. Create useful content and share it with your BNI network on social media. This isn’t hard. Simply create a blog post, webpage, podcast or a video explaining something about your business that you get asked all the time. This becomes social media currency that other BNI members will share or at least remember (feel free to refresh yourself with the video section above). Is it smarter to buy or lease my business location? There’s probably a few questions you get asked routinely. Answer them in the form of online content. Your BNI family will not only remember more about what you do, they’ll likely share that content with their network. Master these social media fundamentals and you’ll be well on your way to authentic connections on any platform. Show up – be where most fellow members are. Be it Facebook, Whatsapp or Instagram – even if you’re not comfortable with the platform. Remember you’re doing this for your business. It’s all about networking. Besides, you’re a pro and will get the hang of it in no time. Listen up – pay close attention to what’s being said. If you jump in without understanding the platform or what’s going on you might embarrass yourself and your company. Speak up – don’t be a passive spectator. Make intelligent contributions to the discussions. Impress people with your insightful comments. Warning: stay clear of religion or politics and other controversial non-professional topics. You’ll get into a lot of trouble and alienate yourself from the very people you want to connect with. Loosen up – Try doing social media as a person, not a company. It’s social after all. So relax, stay clear of corporate speak and have some fun. You connect better with people. Divvy up – be generous and give of your time and expertise. Like and share other people’s stuff. They’ll reciprocate and remember you when they want to recommend someone. 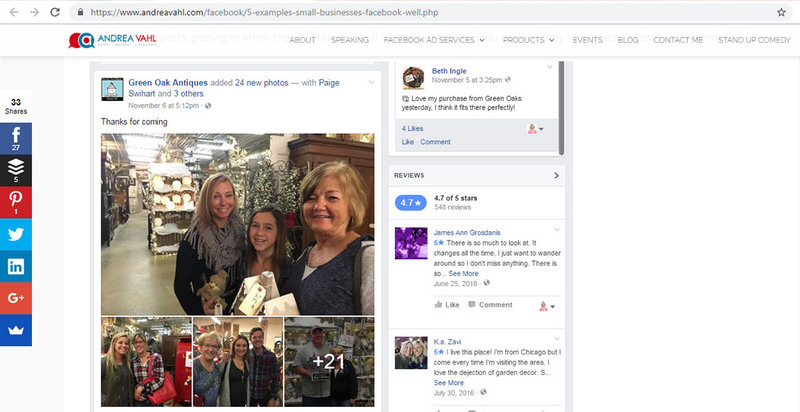 Green Oaks Antiques, a store in Denver, know how to do Facebook well. From pics to reviews, they let their customers take center stage. User-Generated Content resonates with people and converts better. The idea behind this post was to guarantee your online success as a BNI member. BNI is an amazing organization. 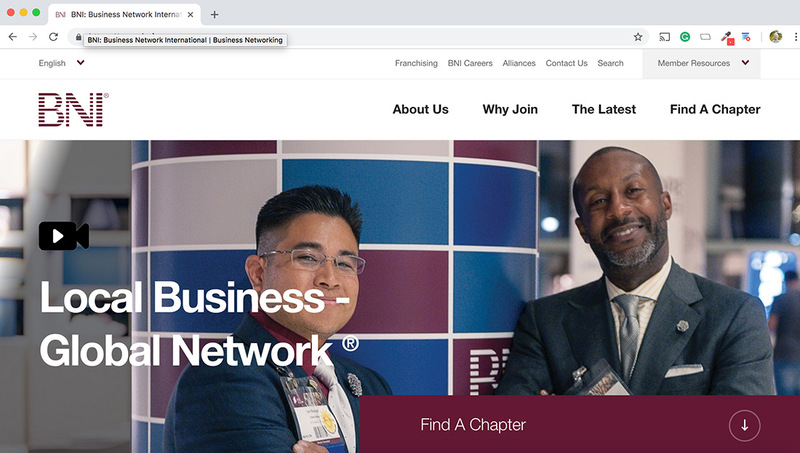 If you use these tips, spend some time creating content and networking with your BNI members online, you’ll take your business even further. It’s a great way to grow your referral base outside your own chapter and start reaching people in other chapters as well. Previous Previous post: The Ultimate Website Design Test: Is It Faster To Find Something On Your Site If You Google It?